There is definitely something to say about about getting up daily at 4am to swim, bike, run, and do whatever is necessary to train for race day. I had plenty of 20 hour training weeks trying to get ready for October 26. Naturally this means many sacrifices. Telling family and friends "I'll get there after my workout" or driving two cars to a friend's party so I can leave early and TKB can stay late. Sam of Optimal Prime Fitness - This year I forced myself into strength training by hiring a strength training. We'v been working together since mid-January and I know for a fact that I wouldn't be in the condition to race without him. I completed the 30 weeks of training completely injury free. While I have no muscle-y beach body (I'm not genetically disposed to that... and it wasn't the goal), I have felt stronger during all my runs and rides and swims. I have less recovery time after races and heavy training day. I just feel more solid through and through. Co-workers - I generally try to not let my training activities impact my job. For those few days that I actually did a lunchtime workout, I may have taken a little longer of a lunch hour. I know there have been times in which I wasn't myself. I had plenty of days where people would ask why I'm not so cheery or acting myself. In fact, after one meeting a coworker gave me a $5 Starbucks gift card for me to use before a presentation I had the following week!! Friends - I am completely grateful of Joe VI and Lauren for moving from 18 miles away to 1.1 miles away this summer. That has given me an extra 30 minutes to get sleep on Friday evenings! You think I'm joking? This is huge! There were plenty of times this past year where we (or just me) were late because I had a workout to complete or leave early so I could get up before dawn to start my 7 hour training day. Countless times I passed out on a friends couch as I was too worn out to socialize. In addition, thanks for putting up with the fact that I only talk about training and racing. Heck, that goes for everyone! Family - You have always been supportive of this new sport I've taken on and I totally appreciate it! 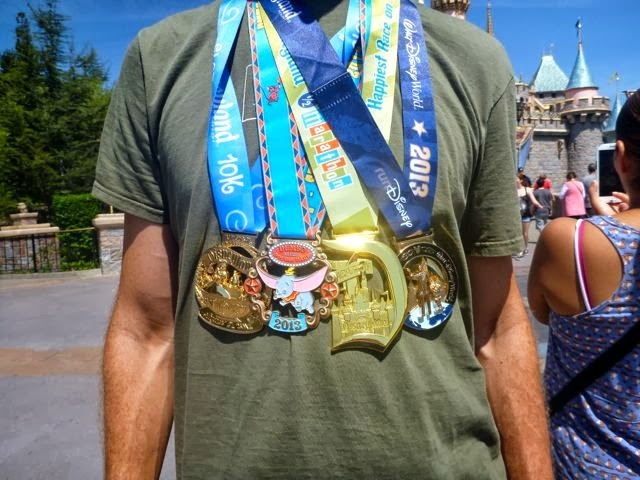 I'm sure watching this lanky tall kid grow up to complete marathons and now ironmans was quite unexpected. I feel totally honored that my parents are driving the 1,200+ miles to sit around for 12+ hours to watch me finish this race. I've gotten plenty of support text messages, emails, and facebook messages throughout this week as well. Thank you!! Brodie - (Yeah, this is our dog). Sorry for freaking you out every time I would ride my trainer as you would skulk around the bike and fan as I ride; however, you sure seemed to enjoy sniffing me up and down after a hard workout. TKB - Of course I couldn't do this without her love and support! I tried my best to complete my training at 5am before work or complete it before she gets home from work. Even so, the last few months I was still killing part or the entire morning/day each weekend while on my bike and running. She even commented that she didn't expect to see me much over the last four weeks and sadly it was true. She continues to put up with my desire to stay a little longer at the bike shop or order that carbon fiber bike part that may save me a few seconds or a few minutes (but hopefully 10 - 20 minutes). She also puts up with complaining of being sore.... and smelly. I really appreciate all the encouragement when things aren't going so well and the excitement when things are. You are what makes this sport happen for me. Now let's get this over so we can kick up our feet at the beach house and relax!! I have completed 29 of 30 weeks of training. This last week, while it does have specific training, is going to be more of a shake out than training but I'll be increasing the intensity for the lower volume to keep the body fresh. Those numbers are averages based on a sampling of my data. Wicked. Now I feel it necessary to get 27 more miles to cross that 3,000 mile mark before the race! Training has gone pretty well. During the base and build periods (first 20 weeks), I pretty well nailed my training. The peak period (last 10 weeks) were definitely tough and cut out a few swims due to the desire to sleep in. My running is feeling awesome, even after 5 and 6 hour bike rides. Many people have asked me if I'm nervous. I would definitely say that the excitement of this race is overshadowing the nervousness. If anything, my biggest concern is the weather. Each day the forecast is getting colder. It calls for partly cloudy with 10 mph winds but zero percentage of rain. As long as we get some sunshine during the day, I'm going to be completely happy. The first few hours of the bike will be rather chilly but I think I've got that covered pretty well. 1. Finish. Naturally the first time you do something, the main goal is to finish. So 17 hours. 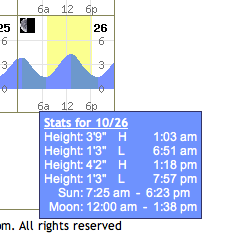 This is the tidal chart for Saturday. When is high tide? 1:03 AM. Low Tide? 6:51AM. That's right. This will be a run-of-the-mill swim. No real help from the current. Crap. So the 80 minutes is what I think it would take me to traverse the 2.4 miles. T1: 6 minutes. This could be 3 minutes or 10 minutes. No clue. When I did B2B 70.3, this was 6 minutes, 17 seconds. It has a long run from beach to the transition area. This seems about right. The course is flat, which is good and bad. As long as the wind isn't too bad and the sun is out, this is going to be a fun ride. T2: 6 minutes. Again. No clue. In 2011 I did 4:34 with a bathroom break. T2 is at a different location, so not sure what obstacles I'll deal with. T2 is technically inside the expo center. They rack your bike inside the convention center and I believe the changing area is as well. This is the wild card. If I pace myself and eat correctly on the bike, I think I'll have an awesome run. Finish: 11 hours, 45 minutes. This puts me 118 seconds faster than the very first Ironman champion. Sounds reasonable. What I am not incorporating here is time for special needs bags. I plan to bring all the nutrition with me out of T1 but I plan to pack extra nutrition and hydration in case I need it. Same thing for the run. I plan to start with everything I need but will pack items in my bag in case I want to change socks or put on a shirt. FYI.. special needs bags are given to athletes halfway through the bike and halfway through the run. Based on how well my training runs are going (including those after my 5+ hour bike rides), I may try to PR the marathon. I am 100% confident I could do that today without requiring a 2.4 mile swim and 112 mile bike ride, so if I feel good about it, I may just go for it. My marathon personal record is 3:29:16. I had trouble figuring out my goals for the race. 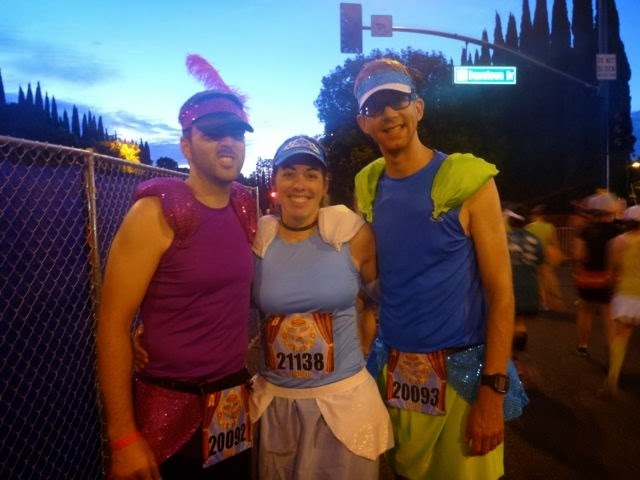 I knew the 10k was going to be a fun run in costumes but the half-marathon had potentials for a massive PR. It was flat and I knew my running speed was better than Hospital Hill Half Marathon, in which I PRed on a nasty hilly course. Could I do 1:35 or even 1:30 on this flat course? Who knows. One thing was for sure, to get me there I wanted a pace group. Unfortunately, the fastest pace group they had was 1:40. What?! 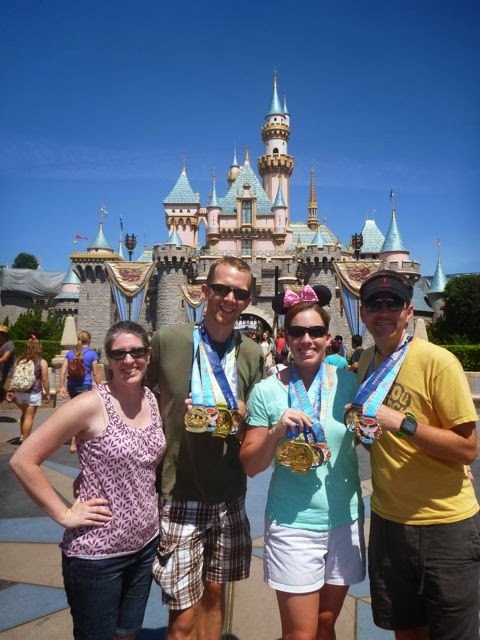 At some point leading up to the race, I decided to just spend my time with 1:40 pace group and enjoy it. I had PR'd in two races over the previous three weeks. I think I was due for nice "relaxing" run. We spent about three hours in lines. It was crazy. First pickup your bibs by waiting outside in the 90 degree sun and eventually into a parking garage-turned-packet pickup. Then you snake out of the packet pickup and into the expo where you pickup your t-shirts. Want to buy some race merch? Pickup your merch and wait in the 2 hour line (no joke). We were so happy to get done with the expo.... so we could go into Disneyland and California Adventure just to wait in more lines. Cinderella and her ugly step-sisters! Naturally, Cinderella (Lauren) made all of our costumes like a good step-sister should. It may not look like it, but I let my beard grow out for a week or so. I'm pretty patchy when it comes to my facial hair. The race started around 6:20 for our corral. 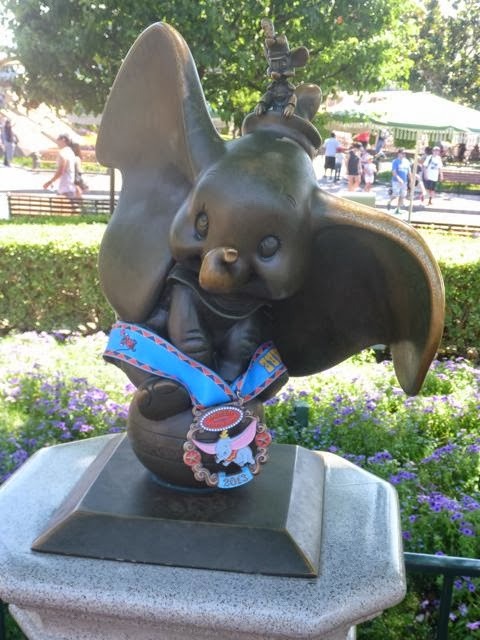 It started going around the south side of the park before returning and entering California Adventure and then into Disneyland before finishing. We got a ton of comments thanks to Lauren's "wicked" crafting skills. 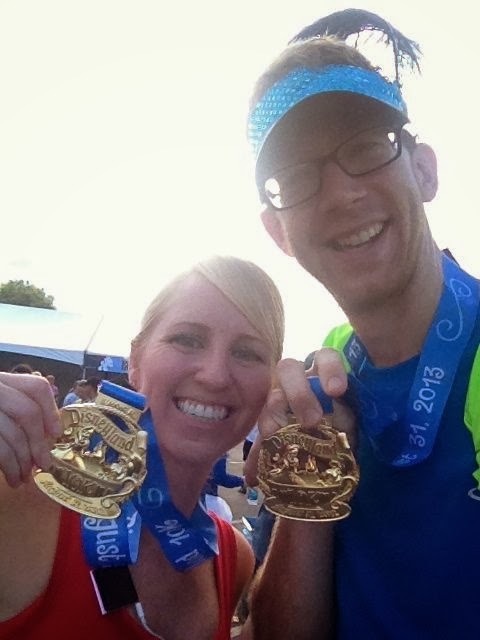 This was posted on the runDisney website! While wondering around in the huge post-race area, I ran into Casey from twitter! We had an opportunity meet when I did Rock'n'Roll Las Vegas two years ago. 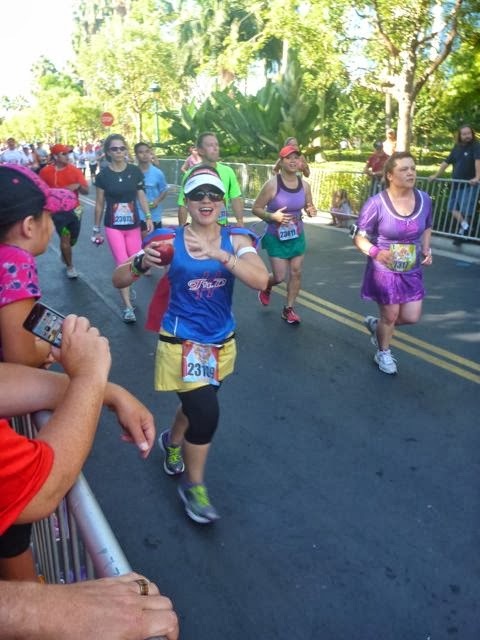 If you look at the "Start" section of my race report, that first photo shows Casey in the yellow hat behind me! We just had no clue how close we were at the time! The race started at 5:30am and I took off pretty early to get near the front of the "A" corral. My sister-in-law Rebecca picked our hotel and fortunately the Starbucks inside of the hotel opened up at 4 am for the race. Nice!!! Naturally as soon as I lined up in a fairly vacant corral I needed to go to the bathroom. By the time I got back it was crazy crowded. So much for that. I did FINALLY line up next to the 1:40 pace group and, frankly, just stayed with them the whole time. We had a group of about 20 people but there were only about 4 or 5 left by the time we hit the finish line. The race started going through California Adventure and then Disneyland. That took about 3 miles. 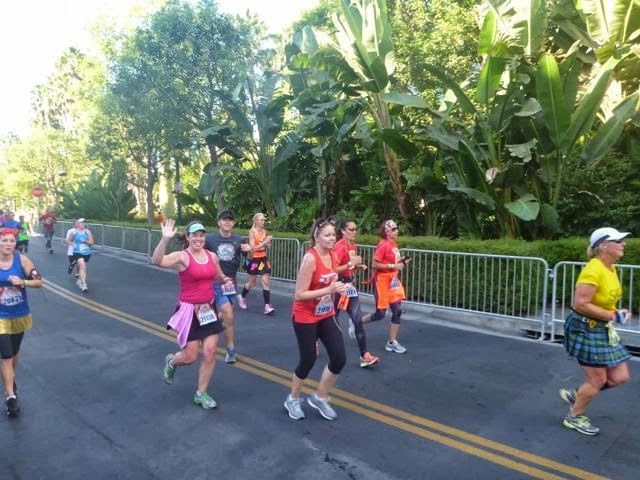 The rest of the race was through industry sections of Anaheim but we did take a trip through the Angels baseball stadium. They did have a mile or so of vintage and new sports cars lined on the streets, which was rather nice. None of them would let me take their cars for a spin though. I ended up finishing 1:38:56, which was only 90 seconds away from a PR. It also meant our pace leader was a bit fast, but that's ok. So that put me 23rd out of 969 in my age group. I guess when put that way, it sure seems impressive! Joe and Lauren finishing the half. My sister-in-law Rebecca finishing her half (and earning her Coast-to-Coast). Yes, she was Snow White carrying that apple the entire way! Rebecca's friend from high school is in the purple top and green skirt behind her. It's been approximately...umm.... a lot of weeks since I last gave an update of my training for Beach2Battleship 140.6. That was week 18 and I'm not at week 27 of my training. Overall the training has gone well. I've had a few a weeks where I've had trouble getting my swims in. I've probably hit about 60% of them but I'm OK with that considering the nature of the swim for B2B (it's with the current, protected from the ocean). I plan to get all of them in until the race. (3 sessions for at roughly 2 miles each). I definitely have a lot to improve on with the swim so I plan to take a a Masters Swim class this offseason and into next season. 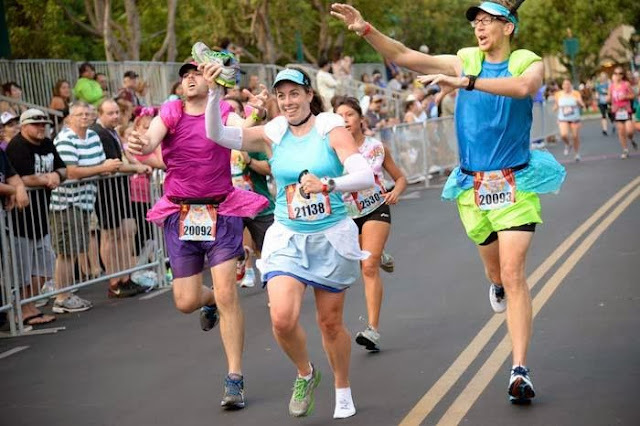 I've hit pretty much all my planned rides except for when I was racing (Pigman Tri, Disney Dumbo Double Dare... yes, a race report is coming!!) and a weekend family trip to Branson. I've been concerned about my cycling coming into August but I'm definitely feeling confident now. I'm reaching 5.5 to 6 hour rides on the weekend and I usually start at 5am. The last two weekends have been really cold. The air temp is about 50 degrees when I start but the wind chill has been reaching 35 degrees, especially in the foggy sections of my routes. On my ride a few weeks ago I had a little snafu shifting uphill and ended up flipping over my handlebars (Yeah, I'm pretty damn talented) but landed "softly" in the ditch. My only injury was cutting up my middle finger on my left hand (which contributed to missing a few swim sessions). I had about 45 minutes left of my ride. I used my bondiband as a bandage and limped home. I decided to take the most direct route, which happened to be during the run portion of the Heartland Heat Triathlon! I had a little fun with that. ("Pssss... don't tell the race officials", "$100 to borrow my bike!"). Nutrition is key on the bike, as I'll talk about in a moment. I had my first century ride last weekend! Sure, I had only planned a 5.5 hour ride, but I added 20 minutes to just get it! As I mentioned in my Head For The Cure race report, I have seen some great improvement in my running discipline with all this cross training. Not only that but throwing down a 19 mile run seems like nothing. Granted, the 6 hour bike ride the day before makes my 2 hour, 45 minute run so much faster. As I mentioned above, nutrition is key. I did a 92 mile bike ride and then followed it up with a 1 hour run. That particular day I only consumed about half as much on the ride as I had planned and I ended up bonking 3 miles into the run. Those 3 miles felt great but then I just ran out of energy and walked home. I almost called TKB to pick me up. The next week I did 101 miles on the bike while consuming the calories as I had planned and then had one of the best runs ever. I even hit a 7:01 minute mile during mile 7 and DIDN'T EVEN FEEL LIKE I WAS RUNNING THAT HARD. I love it!! I haven't come up with my goals for B2B quite yet. I know that simply seeing some great run splits doesn't mean I'm setting any ground records in the 140.6 distance but I do want to be realistic. Ironman training isn't all fun and games. It's definitely hard work. I put in 22 hours of training last week and will do about 23 this week. This past Sunday I was sitting by my bike at 4:45am eating my breakfast absolutely dreading the next 6.5 hours of training (5.5 hour ride plus 1 hour run). I didn't like that feeling. I think it was mostly because it was so cold out and I didn't feel like riding in it. After 2.5 hours when the sun came up, the whole ride changed. It also meant I was almost halfway done with my ride! Because of that, I've decided that my 6 hour ride this weekend will start after the sun is up. The good part of this is it will be when I'm starting my ride at the race but the bad part is I will be 3 hours after I would normally start, so I'm going to be using up most of the day to complete it. Sorry TKB! I've been fortunate that work hasn't impacted my training that much. There have been many nights where I come home from work, train for 1 to 2 hours, then log into work from home to finish. The weekend after next (Oct 12) I have to work all Saturday and then I have a 5K race on October 13. That weekend is going to be either a complete wash in terms of my long ride/run or I get my long ride/run in after the 5k. After that weekend I start my taper, so maybe I'll just start it a bit earlier. Another option (which is what I did for the Branson trip) is do my long run on Thursday and this will allow me to do my long ride on Sunday after the race. Work is about to get A LOT more interesting as well but fortunately that will happen after Beach2Battleship! Looking forward to change! Enough rambling!! Thanks for reading! !